It’s been raining for a week and it is going to be raining for at least another week. September is supposed to be one of the wettest month for Austin and so far it is living up to this legacy. Rain is generally not fun for someone who enjoys landscape photography and I have been hard-pressed to find something to go shoot. I had a camping and hiking trip planned for last Friday night, but it rained all night and I don’t want to camp or hike in the rain and mud. And I really don’t want to get my camera gear wet. And the rain continues. Below is the depressing forecast for the next week. Rain every day. I am watching it rain out the window now. This must be what it is like to live in Seattle. It is still summer and I expect hot days and occasional rain. Anyway, I did stop yesterday as I saw some horses and I thought that the northwestern sky was nice in the background. I could not get very close to the horses and had trouble getting into a position to frame them against the background. 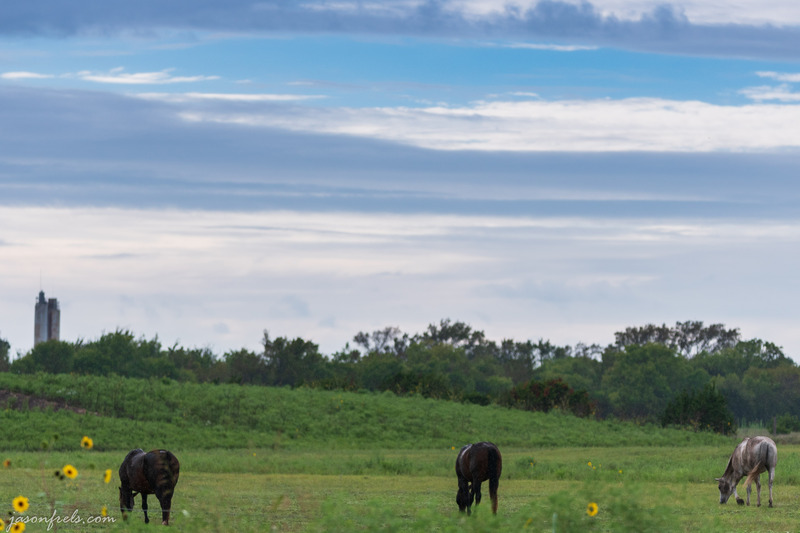 I had trouble getting the horses and sky together well in the same shot as I was shooting from a distance using a longer lens. The horses would not face me so I mainly got horse backsides in the picture. I was able to get the flowers in the foreground. If you look closely you can see that the picture is full of rain drops. I also tried to get some good contrast on the clouds in the sky, which turned out ok. In the next shot I tried to get a close-up of the horse with some blurred out flowers in the foreground. The horses don’t look well in focus mainly because of shooting through rain. 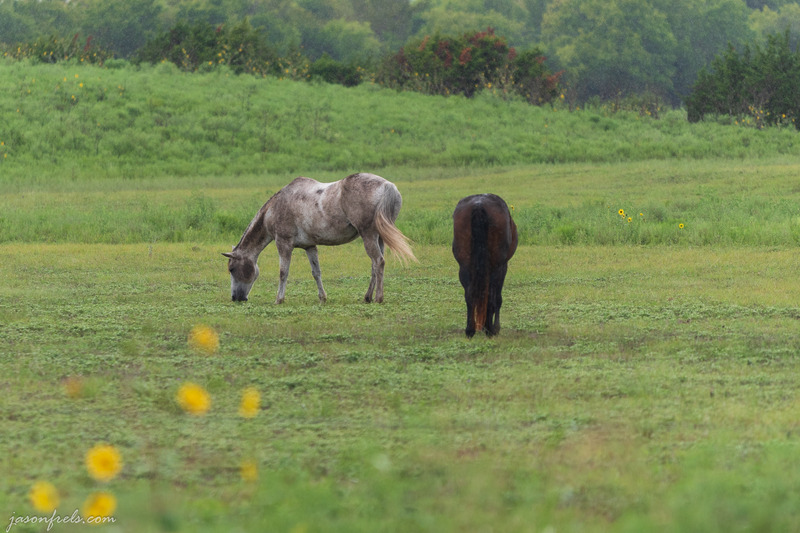 The horses were wet and dirty and the sky wasn’t all that impressive, but I got out to shoot something. The Gulf Coast is yet again getting drown, meanwhile, we have Florence about to pound the Carolinas. Wow. I was considering moving back to Florida, but Las Vegas is much safer… Your photos are always great! I have only been to Las Vegas once and only for a very short time. Seems hot. Perhaps one day I will take some trips out to the parks and public lands out west for some photography. Just a long way to drive from here.